I'm a very experienced motorcyclist. I only passed my test when I was 32 but I've spent the following 16 years riding on average 8,000 miles a year. I ride in winter and in the rain. I commute and tour and ride for fun on a weekend and summer evening. On the bike I constantly think about my skills and how I can improve them. I know my limits and I enjoy pushing them so I can understand more about the bike and myself. I'm a fast rider and, I think, I'm a safe rider. I concentrate and think and observe and react according to conditions and hazards and other road users. But sometimes you cannot prepare for an event and it just smacks you right in the face and you have to deal with it there and then. On my commute home today somebody almost killed me - and he didn't even know about it until it was too late. My commute is 15 miles of roads that are tree lined, winding, poorly paved and with elevation changes. I'm often stuck behind people trundling along at 40mph in a 60mph limit. I will overtake as soon as is safe. When the traffic comes to a stop for a set of lights or roundabout I will filter past them. I'm confident and happy to ride quickly if conditions allow. On the way into work this morning I overtook a car who was ignorant of his surroundings, and the fact I was in them until I appeared in front of him, and beeped his horn in anger. I ignored him in his ridiculous Audi Q8 and sped off. This kind of thing happens often. Car drivers in their steel safety cages - unaware and detached from their environment in their own little bubble. They look down at their phones - I see dozens of them every day - and rely on peripheral vision and driver aids to steer them right. And if they do crash their cars are safe enough to save them from major damage. We bikers have to be on red alert at ALL TIMES. Unfortunately on the way home I wasn't quite on red alert. The road was clear and dry and the light was good. Perfect riding conditions. I was happy and I let my mind wander just a little. I was thinking of things other than my immediate surroundings. I was travelling at 60mph and there was nothing ahead of me except a junction on the right and a parking area on the left - the one in the image above. 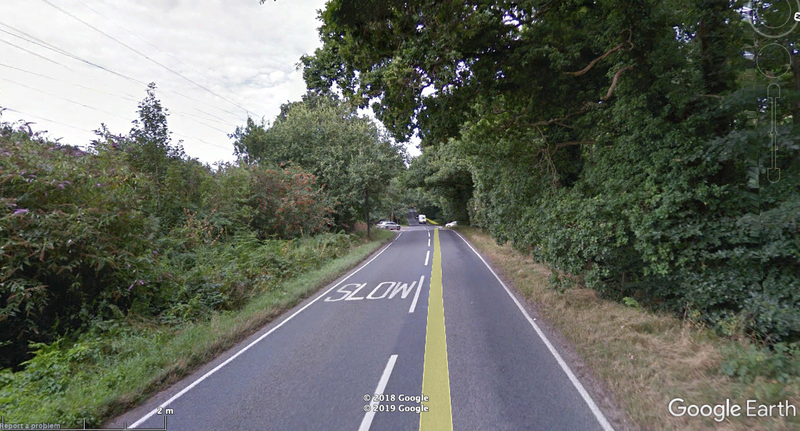 I observed that there were no cars parked on the left and no-one was waiting on the right. But then all of a sudden there was something. A grey Honda CR-V. It didn't stop, pulled right on to the road ahead of me. I was travelling at 27 metres a second and he was pulling out of the junction at 5mph. I first saw him with about 70 metres distance between us. Me doing 60mph and him slowly pulling across the right hand carriageway and into mine at walking speed. The following three seconds happened in slow motion. My brain allowed me to think and do several things at once. The first - pull the brake lever HARD. But not grab it - it has to be progressive. My tires are in good condition and are a good brand but 300kg of bike and rider being pulled to a stop with a contact patch the size of a credit card means no matter how good the rubber the way you brake counts as much as how hard you brake. Get the initial bite right and then you can pull as hard as you like. Grab at the lever and you can lock up, skid and fall down. If I did this I'd probably die. Once the tyre was engaged with the road and started to compress - half a second at most - I pulled at it for all my life. And it did feel like my life could be stopped short. The driver was totally unaware and was not giving me space either side. By the time I arrived at him he would be diagonal across the lane, just short of fully straightening up. I thought about heading to his right but then if I did go down I could be hit by an oncoming car - and that would certainly be fatal. I thought about heading to his left but the bank was steep and dusty and this would affect grip. I would certainly fall down and may end up overtaking him whilst falling over and possibly ending up under his wheels. Instead I opted to stay in the middle where the grip would be at its highest. And it is most efficient to brake in a straight line. As all this happened, as I hurtled toward the rear of the Honda, I thought about my son at home. What he would think and how he would react if someone called at the door and told him his Dad had been killed. I thought about my dog and what would happen to her if I wasn't around. All of this happened in three seconds and 75 metres. My teeth gritted, my eyes on stalks I came within 12 inches of the CRV's rear bumper. Immediately the "emergency mode" my brain had been in turned to "red mist". I overtook the Honda, by this point doing 40, and gesticulated at him. The driver, a middle aged Asian man, had obviously not seen me. He had no idea why I was waving my arms and ranting at him. He had pulled out of a side road and not looked to see if there was anybody coming. Attempted murder by total ignorance. After forcing him to slow to a crawl, further arm gesticulation from me and blank and bewildered faces from him I realised he really had no idea what was going on. I sped off but after half a mile found somewhere to pull over and stopped for five minutes to compose myself. He passed me and I waited a while. By then I'd calmed down and thought I ought to put some distance between him and me. I reflected as I rode home. I take risks every time I go out on the bike. You can be the best and most experienced motorcyclist in the land but there will always be someone waiting to kill you with their ignorance. All you can do is be as prepared as possible. I'll never stop biking just because of uneducated ignoramuses. I just have to resolve to manage my response to them as best as possible.